NEW YORK — Add one more to the list of things dividing left and right in this country: We can’t even agree what it means to be an American. “It’s such stark divisions,” said Lynele Jones, a 65-year-old accountant in Boulder, Colorado. Like many Democrats, Jones pointed to diversity and openness to refugees and other immigrants as central components of being American. “There’s so much turmoil in the American political situation right now. People’s ideas of what is America’s place in the world are so different from one end of the spectrum to the other,” Jones said. There are some points of resounding agreement among Democrats, Republicans and independents about what makes up the country’s identity. Among them: a fair judicial system and rule of law, the freedoms enshrined in the Constitution, and the ability to get good jobs and achieve the American dream. Reggie Lawrence, a 44-year-old Republican in Midland, Texas, who runs a business servicing oil fields, said the country and the Constitution were shaped by Christian values. As those slip away, he said, so does the structure of families and, ultimately, the country’s identity. Patrick Miller, a political science professor at the University of Kansas who studies partisanship and polling, said the results reflect long-standing differences in the U.S. between one camp’s desire for openness and diversity and another’s vision of the country grounded in the white, English-speaking, Protestant traditions of its early settlers. The starkness of the divide and the continuing questions over what it means to be American are a natural byproduct, Miller said, not just of U.S. history, but the current political climate and the rancor of today’s debates over immigration and the welcoming of refugees. Among the areas seen as the greatest threats to the American way of life, Democrats coalesce around a fear of the country’s political leaders, political polarization and economic inequality. Most Republicans point instead to illegal immigration as a top concern. Perhaps surprisingly, fear of influence from foreign governments was roughly the same on the left and right at a time when calls for an investigation into President Donald Trump’s possible ties to Russia have largely come from Democrats. About 4 in 10 Democrats and Republicans alike viewed the issue as extremely or very threatening. Two questions, also posed during the presidential campaign, offered insight into how Trump’s election may have changed partisans’ views. The poll found about 52 percent of Republicans now regard the U.S. as the single greatest country in the world, up significantly from 35 percent when the question was asked last June. Democrats appear to be reinforcing their belief that the country’s range of races, religions and backgrounds make the country stronger. About 80 percent made that assessment in the new poll, compared with 68 percent eight months earlier. The AP-NORC poll of 1,004 adults was conducted Feb. 16-20, using a sample drawn from NORC’s probability-based AmeriSpeak panel, which is designed to be representative of the U.S. population. The margin of sampling error for all respondents is plus or minus 3.9 percentage points. 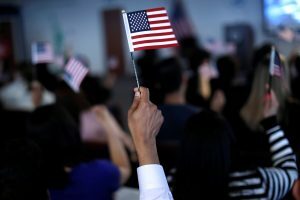 Left: New American citizens wave American flags Mar. 1 after taking the Oath of Allegiance during a naturalization ceremony in Newark, New Jersey. Photo by REUTERS/Mike Segar.